The intensity of tropical rain in Liberia is outstanding. Monrovia is one of the wettest cities on earth, seeing around 4500mm of rain annually, with rain typically falling on the city for 180+ days per year. Much of this rain falls during the long rainy season which typically runs from mid-May through to November. Technique: This shot was taken at shutter speed of 1/250 of a second. However, to me it looks like it was taken at a much slower shutter speed, perhaps around 1/15 of second, which gives you an idea of the intensity of the rain that day. 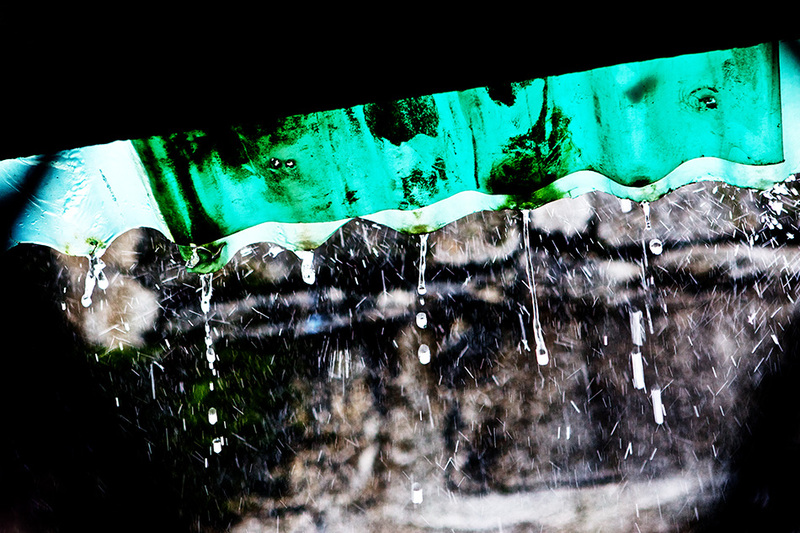 I was first attracted to the shot by the contrast between the rain itself, the dark background and green translucent roof. The contrast in the shot is there because of the bright sun, still high in the sky at 3pm (in equatorial regions of the world, it is common to experience very intense rain and bright sunshine simultaneously, often at around 2-3pm), illuminating the otherwise dark alley with a narrow slit of light, and picking out the sun-bleached green of the plastic roofing. You don’t need to spend much time on the coast of West Africa to appreciate that both sun and rain are powerful weathering agents, slowly breaking down everything.